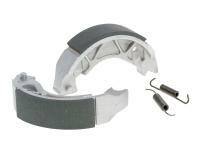 Standard brake shoe set. 2x new springs supplied. Performance and design match the original. 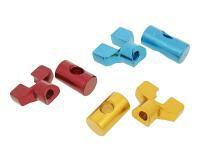 For rear brake use on the following models. Also for front wheel use on MBK Booster-X and Yamaha Giggle! Suitable for Neos / Ovetto 2-stroke models from 2007 on.